You wouldn't know it from the weather but it is the heart of summer, and were coming in to more of our summer crops in week 5. Farmer Figgins is almost through her first weeding of the garden and things are looking great for the next few shares. This week we have green beans making their first appearance, and summer squash beginning to ripen in bulk. We also are seeing some crops come back including our cut lettuce mix, and green onions. The crops eaten by the deer and then reseeded are finally harvestable, so enjoy those spinach heads and bunches of swiss chard! Some tomatoes are starting to ripen in the greenhouse so they will begin appearing in shares soon. Unfortunately some of the first planting of spring crops are waning so we may see a lull in some crops such as Kohlrabi, arugula, and lettuce heads, until the next planting catches up. New this week! We have the first harvest of the Green Beans. 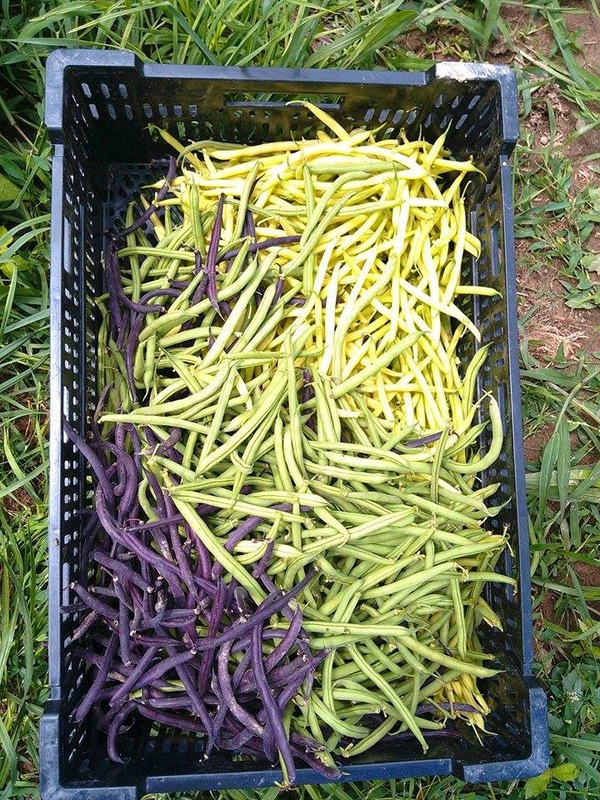 We are growing a mix of varieties this year so you will be seeing a mix of Green, Purple, and Yellow Green Beans throughout the season. This summertime favorite is loved by almost everyone. Raw they are very tasty but there are all sorts of ways to prepare this veggie. Last night we fried them up in a little butter with pepper and garlic. Steam them, bake them, bread and fry them. You can also pickle these along with a few cucumbers! This week we have something unusual for you all--Hakurei Turnips! Hakurei Turnips are not your run-of-the-mill average turnip. These turnips are great raw – sweet and mild, or cooked lightly in stir-fries and soups. They are not spicy and bitter like the standard purple top turnips. In fact, Kids love Hakurei Turnips raw on a salad plate! The greens are also very much edible, just wash, chop and steam or stir fry. In Japan they are often pickled, you can make a quick pickle by adding a teaspoon of vinegar (rice or white wine) and several pinches of salt to a bowl of sliced turnips. Back this week are more green onions. Dice and enjoy with a salad or stir fry! You can also add these tasty onions to a salsa. Another summer favorite that is easy to use in a lot of different recipes. We will have a mix of Zucchini,an heirloom variety, costata romanesco zucchini and Yellow Crook Neck squash for everyone this week. These will be a little small for zucchini bread, but are great to add to any saute or stir fry. You can also grill them, bake them or if you're feeling a little crazy eat them raw. We have more cucumbers this week! This is a slicing variety called "Excelsior" specifically bred for greenhouse growing. Hopefully the lemon cucumbers will be coming soon, and pickling cucumbers are unfortunately a bit behind where we wanted them to be. The variety this week is perfect for a cool cucumber salad. More Broccoli this week. Enough for full shares to have 2 large heads and 4 small side heads. This veggie can be used so many ways it almost seems silly to try and give suggestions for use. You can eat it raw in a salad, put it in a quiche, cook it in a stir-fry, throw it in a soup, steam it and have it as a side to any meal. Let us know your favorite way to eat this super nutritious green! This week the heads ready are a mix of green oakleaf, bibb lettuce, and green romaine. These can form the heart of a great salad along with the other mix of veggies this week. We have several different varieties of lettuce growing on the farm so keep your eyes open for the different heads that will make their way to you throughout the year. We have put some extra planning into planting our lettuces this year so that we can extend the greens through more of the summer so everyone should have lots of opportunities to enjoy lettuce in their salads. 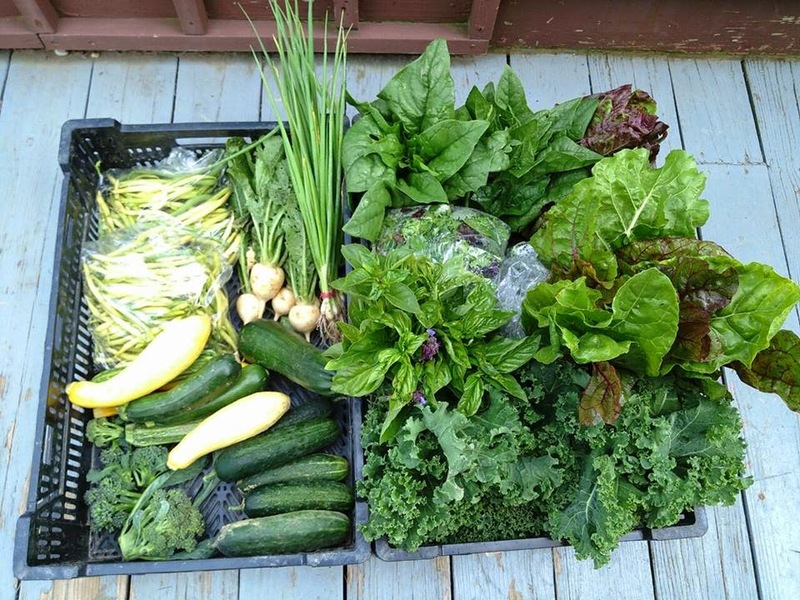 This week we have a mega-green mix and lots of it! Enjoy this combination of the farm's greens--our two salad mixes including mustard, mizuna, tatsoi, kale, arugula, spinach, green oakleaf, read oakleaf, green romaine, and red romaine. Half Shares get a full pound of greens and full shares get 2 pounds! We probably won't have lettuce for another two weeks, so enjoy! This green became a favorite for us at the farm Farmer Don certainly came to love it, despite thinking it was a food fad originally. There are many great ways to enjoy this super food, which is loaded with vitamins. You can of course you can eat it raw, or throw it in a juicer. We really enjoy throwing it in the cast iron with butter, salt, pepper, and some red pepper flakes and sauteing for a few minutes for a great side to any meal. It is also a great healthy snack when you bake them into Kale Chips. Enjoy these multicolored Swiss Chard leaves this week! Swiss Chard is high in minerals and fiber, and looks a bit like a giant beet leaf. Swiss chard with red ribs is often a little sweeter, with less bitter undertone than Swiss chard with white ribs. All the varieties of chard can be prepared the same way, but they can have a different flavor. Some people prefer the ribs, some prefer the leaves, so experiment and enjoy this summer! Try some of these easy recipes to start out. Popeye's favorite. This week everyone is getting a head of spinach. This is one of the so called super-foods because it is so filled with vitamins and minerals that are good for us. This is also a favorite of juicers. Along with Kale, Swiss Chard and some fruit you can make a very healthy delicious smoothie. We love to add it fresh to any salad, or sandwich. It's also great sauteed. One of Farmer Figgins' favorite sandwiches is sauteed spinach and mushrooms with feta cheese on sourdough, yum! If you're feeling adventurous feel free to add it to a pizza! 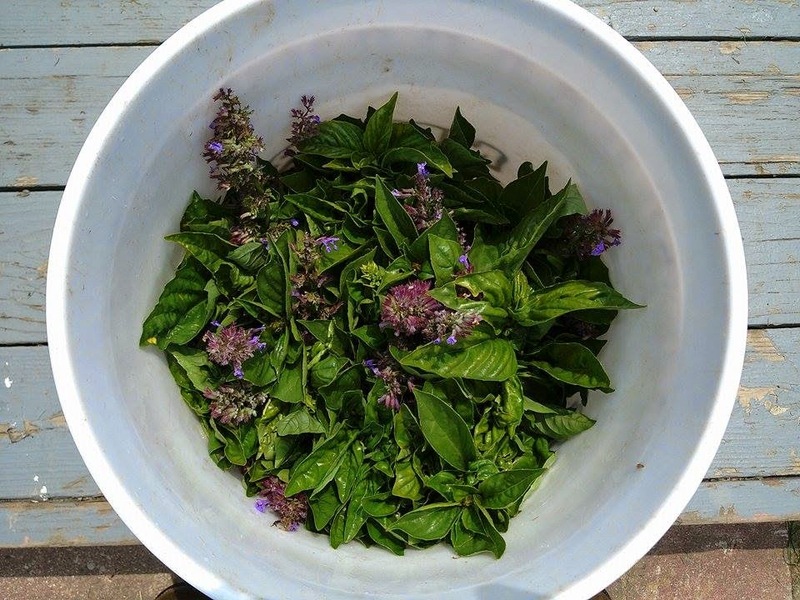 We've got bunches of Catmint, Genovese Basil, and lemon basil this week, enjoy!